Molly loves to bounce all day long on her space hopper! She's looking a bit pale though and needs some colour. Can you guess what colour hair Molly has? Why not colour in the puzzle using the special codes? You'll discover what colour tee shirt and trousers Molly is wearing too. Why not Download the Space Hopper Colouring Puzzle right now and see if you can help. This puzzle is aimed at 4 to 7 year olds, it's a fun way to teach children about colour and help them to recognise letters and words. 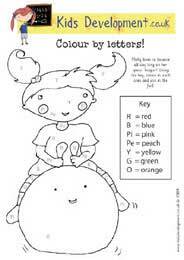 It also helps to build their fine motor skills through pencil control when colouring in.